Figure 17-36 is a functional block diagram of the shunt-type regulator. Each of the components shown in the figure performs the same function as its counterpart in the series regulator (Figure 17-28), but notice in this case that the control element is in parallel with the load. The control clement maintains a constant load voltage by shunting more or less current from the load. It is convenient to think of the control element in Figure 17-36 as a variable resistance. When the load voltage decreases, the resistance of the control element is made to increase, so less current is diverted from the load, and the load voltage rises. Conversely, when the load voltage increases, the resistance of the controlelement decreases, and more current is shunted away from the load. 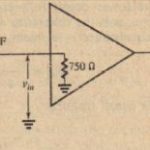 From another viewpoint, the source resistance Rs on the unregulated side of ~igure 17-36 forms a voltage divider with the parallel combination of the control clement and R,.. Thus. when the resistance of the control clement increases, the resistance of parallel combination increases. and. by voltage-divider action. the load voltage increases. 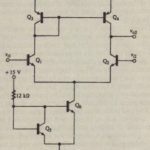 A discrete shunt regulator in which transistor QI serves as the shunt control clement. Since V7. is constant, any change in output voltage creates a proportional change in the voltage across R,. Thus, if. Vii decreases, the voltage across RI decreases, as does the base voltage of 02 ..O~conducts less heavily and the current into the base of QI is reduced. 01 then conducts less heavily and shunts less current from the load, allowing the load voltage to rise. Conversely, an increase in V” causes lx th QI’ and O2to conduct more heavily, and more current is diverted. 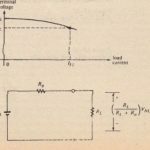 One advantage of the shunt-regulator circuit shown in Figure 17-38 is that it has inherent current limiting, It is clear that the load current cannot exceed Vi,,!R4, which is the current that would flow through R4 if the output were snortcircuited. Since load current must flow through R4, the power dissipation in the resistor may be quite large, particularly under short-circuit conditions. A principal disadvantage of the series and shunt regulators discussed In Section 17-7 is the fact that the control element in each type must dissipate a large amount of power. As a consequence, they have poor efficiency; that i~, the ratio of load power to total input power is relatively small. 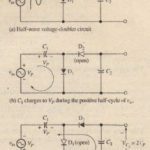 Since the control element, such as a pass transistor, is operated in its active region, power dissipation can be quite large, particularly when there is a large voltage difference between Vi” and Vo and when substantial load current flows. When efficiency is a major concern, the switchingtype regulator is often used. In this design, the control element is switched on and off at a rapid rate and is therefore either in saturation or cutoff most of the time. As is the case with other digital switching devices, this mode of operation results in very low power consumption. The fundamental component of a switching regulator is e pulse-width modulator, illustrated in Figure 17-39. This device produces a train of rectangular pulses having widths ,that are proportional to the device’s input. The figure illustrates the pulse output corresponding to a small de input, the output corresponding to a large de input, and that corresponding to a ramp-type input. 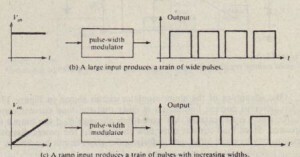 To produce a periodic sequence of pulses, the pulse-width modulator must employ some form of oscillator. 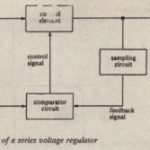 Practical modulators used in switching regulators usually have inherent oscillation capabilities incorporated into their circuit designs. Figure 17-40 shows how a pulse-width modulator (used in power amplifiers) can, be constructed using a voltage comparator driven by a sawtooth waveform. The duty cycle of a pulse train is the proportion of the period during which the pulse is present, i.e., the fractional part of the period during which the output is high. For example, a square wave, which is high for one half-cycle and low for the other half-cycle, has a duty cycle (If 0.5, or 50%. By definition where VIII is the high. or peak. value: of the pulse. Equation l7-46 is valid for pulses that alternate between 0 volts (low) and VIII volts. A switching regulator uses a pulse-width modulator to produce a pulse train whose duty cycle is automatically adjusted as necessary to increase or decrease the de value of the train. The basic circuit is shown in Figure 17-41. 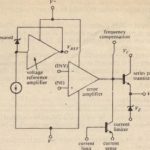 Note that the output of the pulse-width modulator drives pass transistor Q,. When the drive pulse is high, QI is saturated and maximum current flows through it. When the drive pulse is low. Q, is cut off and no current flows. Thus, the current through Q, is a series of pulses having the same duty cycle as the modulator output . As in the regulator circuits discussed earlier, the zener diode provides a refer ence voltage that is compared in the operational amplifier to the feedback voltage obtained from the R,-R~ voltage divider. 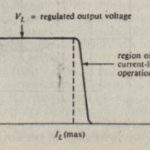 If the load voltage V” tends to fall, then the output of the operational amplifier increases and a larger voltage is applied to the pulsewidth modulator. It therefore produces a pulse train having a larger duty cycle. The pulse train switches QI on and off with a greater duty cycle, so the de value of the current through Q, is increased. The increased current raises the load voltage III compensate for its initial decrease. Frequencies are limited by the inability of the power (pass) transistor to turn onand off at high speeds. Many modern regulators use power MOSFETs of the yrvlOS design, instead of oipolars, because of their superior ability to switch heavy loads at high frequencie (see Section 16-11 on MOSFET power amplifiers). The switching regulator in Figure 17-41 is designed to maintain a I~V-dc output when the unregulated input voltage varies from 15 V to 24 Y. When pass transistor 01 is conducting, its collector-to-emitter saturation voltage is 0.5 Y. 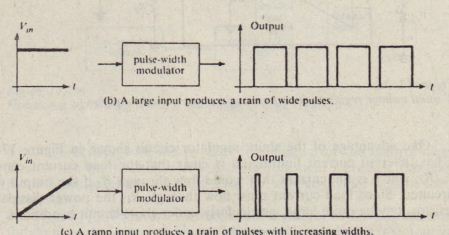 Assuming that the load is constant and the LC filter is ideal (so its output is the de value of its input), find the minimum and maximum duty cycles of the pulse-width modulator. Solution. When V”,has its minimum value of 15 Y, the high voltage of tbe pulse train at the input to the filter is 15 – VCE(su,) = 15 – 0.5 = 14.5 Y. The duty cycle of-this pulse train must be sufficient to produce a de value of 12 Y. From equation 17-46. TwiT =: V,trIVIII = 12/14.5 = 0.828. Thus, the maximum duty cycle, corresponding to the smallest value of Vin• is 0.828, or 82.8%. When Vin has its maximum value of 24 Y, we find the minimum duty cycle to be 1’11I/1′ = 12/(24 – 0.5) = 0.51.